This event remains as one of Europe's unsolved UFO cases. It began at about 8:30 AM, September 10, 1990, when the first sighting of a spherical, metallic object with legs was made. 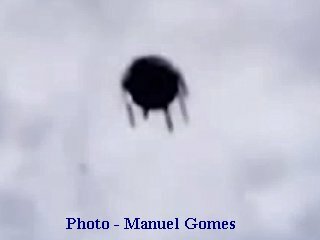 The object was either moving very slowly, or hovering in the sky at a low altitude. The object was reflecting the early morning sun, which caused on-lookers to surmise the object was made of some type of metal. In a short period of time, as many as 25 witnesses were observing the UFO. Local residents were surprised and even frightened by the sight of the UFO. Some even tried throwing rocks at the object, in an attempt to shoo it away. Soon four pictures would be taken, forever documenting the event for posterity and further study by UFO students. Manuel Gomes, sitting at a local diner, was soon told of the sightings. He was a photojournalist and worked with the Morning Journal News. He quickly gathered his camera and rushed to the location of the latest reported sighting. He managed to take four photographs of the object. He was unable to identify the object as anything he had seen before. He turned over his report and photographic negatives to the CNIFO research group, who began an investigation into the events of the day. After about an hour, the unidentified object finally flew away into the horizon, leaving many questions as to its origin and purpose. As researchers began to discuss the sightings, various theories were offered. The photographs taken by Gomes were examined and found not to have been tampered with. What was seen in the Alfena skies was exactly what was on his photographs. The big mystery was: what was the object? Of the many theories offered, the most plausible was that the object was some type of observation device, possibly launched by the military. However, the military claimed to have nothing in the air at that time and location. The case of the Alfena, Portugal craft remains unsolved to this day.